Does the programme – War on Britain’s Roads – present an unbalanced and sensationalist view of conditions on the road network? If you think so, complain to the BBC setting out the ways in which you feel it has misrepresented the situation. Cyclist.ie says: “The helmet-cam footage shows how most of the problems faced by cyclists on roads and streets happen at junctions (including roundabouts) and within the bus and cycle lane system simply because drivers won’t acknowledge that cyclists are entitled to be there and that our roads are a shared public space. Many drivers just don’t understand that they are not permitted to encroach into a cycle lane. The ‘dangerous overtaking’ traffic regulation is just not being detected or enforced by police services in these Islands. 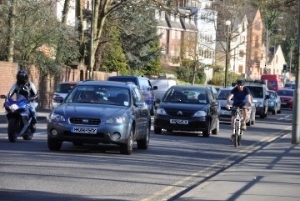 Drivers should not be overtaking cyclists unless they can give a space of about 1.5 metres. If traffic and road conditions don’t permit this clearance then don’t overtake; hold-back until it’s safe to overtake the rider. Cyclists: NEVER “undertake” an HGV – i.e. go up the inside of one – it’s one of the single biggest causes of fatal accidents. Cyclist.ie also wants ALL HGV’s to have appropriate mirrors and for drivers to be appropriately trained – most of these types of accidents are preventable. See ~46 minutes into YouTube video.